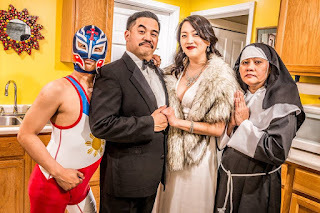 I attended the Saturday matinee of Mu Performing Arts' world premiere play Tot: The Untold, Yet Spectacular Story of (A Filipino) Hulk Hogan with all three of the Minnesota Theater Lovers (my friends and fellow theater bloggers). As we chatted over our post-show meal at the Afro Deli, it soon became apparent that we had very different experiences at the show. I find this fascinating and actually kind of cool, how two people can watch the same thing and see something entirely different. That's the beauty of theater, a beauty that, like for any art, is in the eye of the beholder; the theater-goer is just as important as the theater-makers in creating the experience. You'll have to head over to Minnesota Theater Love to read their perspective, and read on here for mine. Which is that Tot is, while a bit wacky and unclear in parts, a compelling and moving story of a boy whose world is turned upside down and who deals with it through a rich fantasy world. There are several different realities depicted in the play. First, there's Tot's happy childhood life in the Philippines, living with his grandmother since his parents moved to America to make a better life for their family. After living with her for eight years, he leaves his beloved Lola behind when his parents finally send for him to come live with them in America. Here we enter the world of 1980s America (complete with '80s toys like a Glo Worm), where Tot feels isolated and lonely living with parents who abandoned him and a sudden sister he never knew. Interspersed with this "real life" storyline we see scenes of Tot's imaginary life (although that's not entirely clear until partway through the show). Obsessed with Hulk Hogan and the WWF, Tot invents a character called The Orbiter (named after the street he lived on in the Philippines) an abandoned child raised by a nun who's discovered and turned into a wresting star. He imagines his parents as the cruel announcer and a glamorous woman/wrestling character. The Orbiter is almost destroyed by a wrestler called "The American Dream," until he fights back and conquers not only the other wrestler but also the announcer/father. Meanwhile in the real world, Tot bullies his sister and invents friends as he struggles to adapt to his new life. In the end, I'm not sure if he ever does, or how he does, as we quickly fast-forward to a grown-up Tot returning to visit the Philippines, seemingly with a lot of regrets. I was moved almost to tears at the end of the play, which I blame on co-director Ellen Fenster, who's made me cry on more than one occasion. And I also blame director Randy Reyes, whose boyish charm is put to good use playing the nine-year-old Tot. He's such a sad, sweet, obnoxious little boy who takes out his pain on his poor sweet sister (played by Randy's real-life sister Stephanie Bertumen). Eric "Pogi" Sumangil is charismatic as Tot's ballroom dancing father, displaying both his charm and his rather disturbing dark side, and the wrestling announcer. Also wonderful is Hope Nordquist as Tot's mother; the mother/son confrontation (why did you leave me?!) is one of the more poignant scenes of the play. Mary Ann Prado is lovely as the loving grandmother and fantasy nun character. And of course Torsten Johnson plays Tot's imaginary wrestling alter-ego, his powerful physicality perfectly suited to the role while still bringing out the vulnerability in the character that's really a little boy's dream of himself. Rounding out the cast are Michelle de Joya and Kyle Legacion as the "chorus," dressed in referee gear and showing placards to the audience between scenes describing the setting. Similar to the last show in Park Square Theatre's Boss Stage, Sandbox Theatre's Queen, the theater space is set up in the round as a boxing ring. The fantasy world takes place on the outer edge of the ring (complete with a red velvet rope that the actors step over while ducking under the imaginary upper rope). The real world takes place in the center, lower, part of the ring, with props stored handily beneath the ring (set design by Sarah Brandner). Samantha Fromm Haddow nicely clothes both the real world and the colorful fantasy world. The wrestling scenes are well choreographed by Brandon Ewald, although a fight scene with a lot of slapping is a bit too real in light of the recent news out of Chicago. This play makes me wonder about the life of playwright Victor Maog (his first full-length play, commissioned by Mu), because this feels very personal and very specific. Yet anyone who's ever felt lost, abandoned, or lonely can relate to the story and the emotions of the characters. Tot: The Untold, Yet Spectacular Story of (A Filipino) Hulk Hogan continues only through June 26. Take a chance on a new play and experience something beautiful and moving, or not so much. That's up to you.